Master Traders introduces you to an outstanding group of financial experts—from seasoned hedge fund managers to top technical analysts—who discuss the methods they use to tame today’s highly volatile and unpredictable markets. 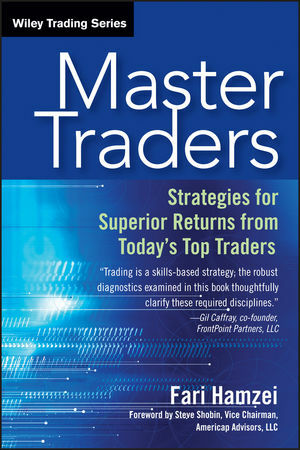 Composed of chapters contributed by leading financial professionals, Master Traders contains a variety of proven strategies and techniques that will give you an edge in the world of stocks, options, and futures. Fari Hamzei is founder of Hamzei Analytics, LLC, which provides cutting-edge proprietary analysis and indicators to institutional and professional traders. He is also group leader of the Los Angeles eSignal/Trade Station/ Real Tick/ Metastock Users' Group and the former vice president of Market Analysts of Southern California. Hamzei is a nationally ranked Market Timer (as ranked by Timer Digest). He holds a BSE degree in financial engineering from Princeton University, and was a director of strategic planning at Northrop Grumman Corp., Aircraft Group. He is frequently quoted by CNBC, Bloomberg, RealMoney, and other financial media outlets.